Walnuts are one of the best plant sources of protein. They are rich in fiber, B vitamins, magnesium, and antioxidant such as Vitamin E. Walnuts have significantly higher amounts of omega 3 fatty acids as compared to other nuts. Incorporating walnuts in a healthy diet reduces the risk of heart disease by improving blood vessel elasticity and plaque accumulation. Walnuts have also been shown to aid in lowering LDL cholesterol (the bad cholesterol) and the C-Reactive Protein (CRP). CRP was recently recognized as an independent marker and predictor of heart disease. The FDA has recognized the benefits of walnut and their role in heart disease prevention by approving them. They contain less than 4g of saturated fats per 50g. Nuts in general are high in calories, so moderation is the key. Instead of just adding walnuts to your current diet, eat them in replacement of foods that are high in saturated fats. Walnuts add a flavorful crunch to dishes. 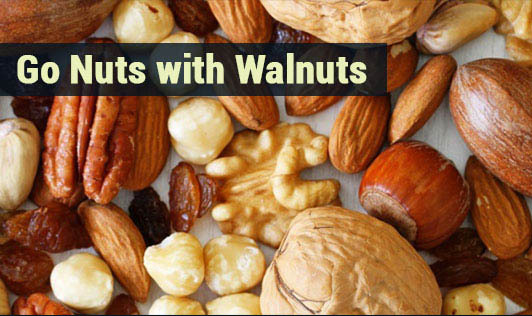 • Instead of snacking on cookies, crack some walnuts and eat them as snacks. • Instead of using meat, toss toasted walnuts in your salad or pasta to add some crunch. • Instead of layering pepperoni, use chopped walnuts in your pizza. • Instead of eating bacons or eggs, use walnuts as a protein choice by sprinkling chopped walnuts in your oatmeal or breakfast cereal.